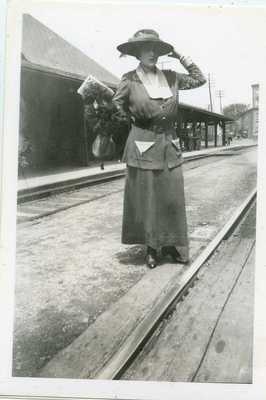 "Maxine at the Whistle Stop "
A black and white photograph in the Diana Forbes-Robertson collection on her aunt, Maxine Elliott, an internationally renowned actress born in Rockland, Maine in 1868. Placed in an envelope that reads, "Maxine at the whistle stop on the 'Lord and Lady Algy' tour (with William Faversham)." The back of the photo includes the note, "ca 1917?"